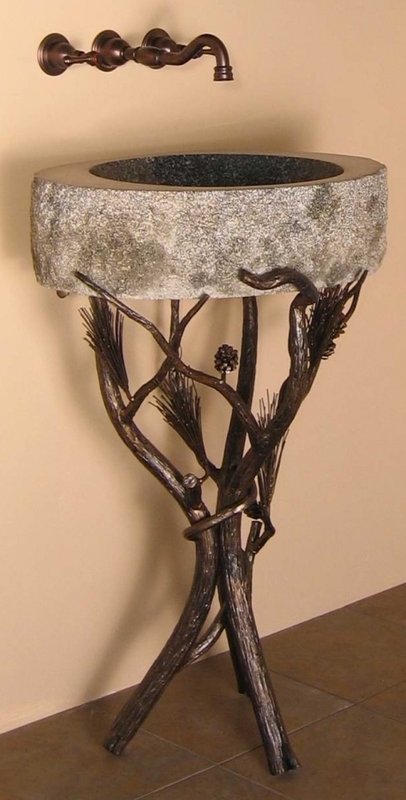 Thick, branch-like legs come together to form the sturdy base of this pedestal. Made of forged iron and accented with pine needles, this piece adds a touch of the great outdoors to any bathroom or powder room. Available in a variety of finishes, it will be a wonderful focal point wherever it is installed. Material: Iron is a hard ferrous metal. It is made by the same refinement process as steel but is left with more impurities. Iron is used in building structures and anywhere large heavy loads are in need of support. Forged Iron is heated and shaped to achieve a desired form. Granite is a hard non-porous surface, which makes it an ideal material for sinks and countertops. Granite resists heat, scratches and stains, and protects against mold and mildew. It’s recommended that you seal granite every 6 - 12 months.